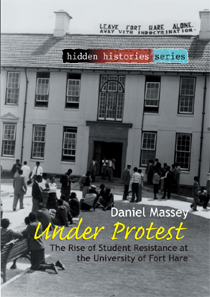 Under Protest, by Fort Hare alumnus Daniel Massey, combines a trove of previously untapped university records with the recollections of dozens of former students to dig deep into the complex past of the institution that educated figures like Tambo, Nelson Mandela, Mangosuthu Buthelezi and Robert Mugabe. Through the eyes of former students, we see just how the university veered sharply off the course intended by its missionary founders and apartheid trustees, giving birth to many of the most important leaders in South Africa’s struggle for democracy. Massey interviews Fort Harians ranging from Govan Mbeki and Wycliffe Tsotsi to Jeff Baqwa and Thenjiwe Mtintso, who explain the vital role Fort Hare played in the development of their activism. He pays particular attention to the 1960 government takeover, showing how the authorities’ attempt to stifle student protest ended up creating the hothouse conditions that eventually brought apartheid to its knees. For information on Under Protest events and to view photos and video, visit the book's Facebook page.